Very well built, reliable, spacious, and cooks well. Can be a touch difficult to see the food cooking, particularly in a bright kitchen. The bulb would in theory be difficult to replace. 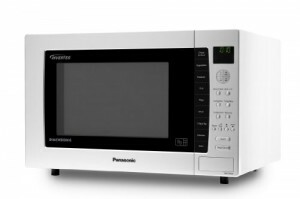 If your budget is around the £200 mark, and you're looking to buy a reliable family microwave, then you might be interested in the Panasonic NN-CT870W. Providing 1000w of power when in regular microwave mode, 1500w when using the grill (with 3 different settings) and a convection oven catering for between 100 and 250C, this is a pretty versatile kitchen appliance. In terms of capacity, it's pretty big - 32 litres in size, measuring 53 by 34.4 by 50.8cm - so make sure you have room in your kitchen prior to purchasing. Internal dimensions are 35cm by 25cm by 36cm - and so this should fit the majority of dishes. 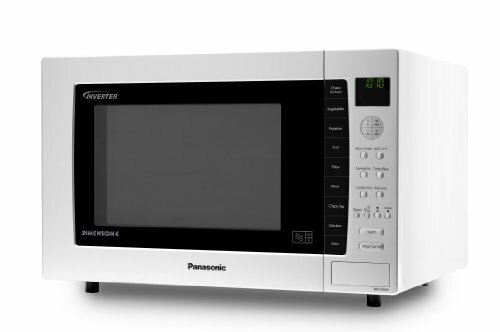 As you'd expect from Panasonic, build quality is excellent - we can't see there being any durability issues with this combination microwave oven. There are various preset auto settings - Vegetables, Fish, Pizza, Meat, Crispy Top, Chicken and Bake - although you are obviously not restricted to these and so will be able to set your own time and temperature settings. You can even set up to three of your own programmable pre sets - saving yourself from having to enter in the same settings repeatedly. The inside is very easy to clean - and the controls for this microwave, although daunting at first, are in fact pretty easy to use. 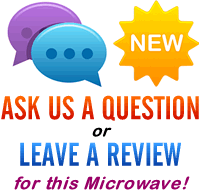 The only two faults we can find with this excellent and well thought out microwave are that the interior is a black enamel material, which can make viewing the interior a touch difficult, and secondly that the bulb can't be easily replaced by the user, and so you may need an engineer to come out to fit a new one should there be any issues. That said, overall the microwave performed very well, and we wouldn't hesitate to recommend it if your budget can stretch this far. An expensive white combination microwave with a whole host of features - feels like it's built to last, and works very well. It may be slightly out of some people's price range, but if you can afford the retail price, then it's well worth considering.